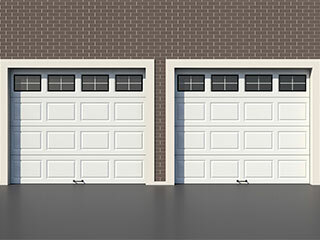 Home Blog What’s The Best Material For Your Garage Door? A new garage door can be a great upgrade for your home, and can really increase the security, safety and curb appeal of your property. There are many different models on the market, and we know how difficult it can be to choose the right one for your needs. That’s why we’ve put together this quick guide to choosing the right garage door material; this should be the first decision you make. There are 3 main types of garage door material; steel, aluminum and wood. Each material has different benefits and downsides, and will be suited to different purposes. For example, a wooden door might be the perfect choice to add a classic statement to a luxury home, but the regular upkeep it requires means it may not be the right choice for a busy family home. Steel is strong and relatively easy to work with, and it’s one of the most common materials used in overhead doors. Because of its strength, steel provides great security against intruders, and can come with a wide variety of finishes. It can even be made to look like real wood; the Clopay Canyon Ridge series uses real wood grain to create a convincing faux-mahogany effect. Of course, steel is a relatively heavy material, which requires a correspondingly powerful opener. It can also suffer from rust, so homeowners who live in humid coastal areas and want a steel garage door will need to take some preventive measures. Aluminum is similar to steel in many ways; it can be easily worked into many different designs, and there are plenty of finishes to choose from. However, it’s far from being as strong; if you’re worried about thieves breaking in while you’re away, this may not be the right material for you. Burglars might find it easier to get through an aluminum garage door than a steel one. While it isn’t as strong, aluminum is much lighter than steel. This means it requires a less powerful (and less expensive) opener to drive it, and will also likely require less maintenance, as it does not rust. There’s nothing quite like a real wooden garage door to add that little extra curb appeal to a property. Some modern wooden doors can be almost as strong as metal ones; wood doesn’t dent or scratch in the same way that metal does, and damage can be sanded out more easily. However, wood requires regular sealing in order to prevent weather damage, and can warp or even rot if it isn't cared for properly. It is also much more expensive; doors made from this material usually cost more, and since they tend to weigh a lot too, you’ll also need a powerful opener to operate them. Give our experts at Garage Door Repair Maple Grove a call and let us help you make the right decision for your home.